An orbital ring that has fixed tethers hanging down to the ground. An orbital ring is a concept of an enormous artificial ring placed around the Earth that rotates at an angular rate that is faster than the rotation of the Earth. It is a giant formation of astroengineering proportions. 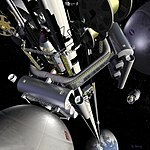 The structure is intended to be used as a space station, space elevator or as a planetary vehicle for very high speed transportation or space launch. The original orbital ring concept is related to the space fountain and launch loop. Arthur C. Clarke's novel The Fountains of Paradise (1979) is about space elevators, but an appendix mentions the idea of launching objects off the Earth using a structure based on mass drivers. The idea apparently did not work, but this inspired further research. Paul Birch published a series of three articles in the Journal of the British Interplanetary Society in 1982. Anatoly E. Yunitskiy, author of string transport idea, also published a similar idea in USSR in 1982 and later explored it in detail in his book published in 1995. Andrew Meulenberg and his students, from 2008 to 2011, presented and published a number of papers based on types and applications of low-Earth-orbital rings as man's "stepping-stones-to-space". An overview  mentions four applications of orbital rings. Several different methods and designs have been suggested for the construction of an orbital ring. A simple unsupported hoop about a planet is unstable: it would crash into the Earth if left unattended. The orbital ring concept requires cables to the surface to stabilize it, with the outward centrifugal force providing tension on the cables, and the tethers stabilizing the ring. In the simplest design of an orbital ring system, a rotating cable or possibly an inflatable space structure is placed in a low Earth orbit above the equator, rotating at faster than orbital speed. Not in orbit, but riding on this ring, supported electromagnetically on superconducting magnets, are ring stations that stay in one place above some designated point on Earth. Hanging down from these ring stations are short space elevators made from cables with high-tensile-strength-to-mass-ratio materials. Although this simple model would work best above the equator, Paul Birch calculated that since the ring station can be used to accelerate the orbital ring eastwards as well as hold the tether, it is therefore possible to deliberately cause the orbital ring to precess around the Earth instead of staying fixed in space while the Earth rotates beneath it. By precessing the ring once every 24 hours, the Orbital Ring will hover above any meridian selected on the surface of the Earth. The cables which dangle from the ring are now geostationary without having to reach geostationary altitude or without having to be placed into the equatorial plane. This means that using the Orbital Ring concept, one or many pairs of Stations can be positioned above any points on Earth desired or can be moved everywhere on the globe. Thus, any point on Earth can be served by a space elevator. Also a whole network of orbital rings can be built, which, by crossing over the poles, could cover the whole planet and be capable of taking over most of freight and passenger transport. By an array of elevators and several geostationary ring stations, asteroid or Moon material can be received and gently put down where land fills are needed. The electric energy generated in the process would pay for the system expansion and ultimately could pave the way for a solar-system-wide terraforming- and astroengineering-activity on a sound economical basis. If built by launching the necessary materials from Earth, the cost for the system estimated by Birch in 1980s money was around $31 billion (for a "bootstrap" system intended to expand to 1000 times its initial size over the following year, which would otherwise cost 31 trillion dollars) if launched using Shuttle-derived hardware, whereas it could fall to $15 billion with space-based manufacturing, assuming a large orbital manufacturing facility is available to provide the initial 180,000 tonnes of steel, aluminium, and slag at a low cost, and even lower with orbital rings around the Moon. The system's cost per kilogram to place payloads in orbit would be around $0.05. General Planetary Vehicle (GPV) - a Anatoly Yunitskiy's project for the removal of weight at low circumplanet orbit. GPV is a ring located on the equator of the Earth (or parallel to the equator) consisting of individual segments connected (for example) by hydraulic cylinders. Inside the ring segments there are cells for placing the payload and necessary equipment. The heart of the GPV consists of two circular channels passing through all the segments of the ring. High vacuum is kept up in the channels and they are completely isolated from the environment. Inside these channels there are two magnetically levitated flywheel rotors assembled from small metal and flexible (e.g., polymer) segments. The flywheel rotors are held by an electromagnetic system mounted inside the GPV shell, according to the principle of magnetic levitation and act as the rotors of the giant motor (capable of operating in a generator mode as well). The GPV ring is located on a specially equipped overpass, encircling the Earth. In the initial condition it is fixed on the overpass. With the help of an external energy source one of the rotors spins up to speed higher than the First Cosmic Velocity at sea level (i.e. orbital speed at sea level, same as the escape velocity divided by root two). Due to the centrifugal force, the rotor (having reached the First Cosmic Velocity) balances itself and then seeks to "fly" up, producing lift force. The rotor's speed is to be a little more than necessary to balance the ring. After releasing the clamp the GPV ring begins to rise up (increasing its radius, and accordingly, the diameter). Thus, the hydraulic cylinders and gaps between the segments allow the formation to increase its length. The belt rotor stretches by 2-5% due to its elasticity. Having achieved the required height the rotor transfers to the generator mode, and the electricity generated is used to boost the second rotor in the opposite direction. As a result, the GPV accelerates to achieve the First Cosmic Velocity on a low Earth orbit. The height reached by the GPV is determined by the abundant rotor's initial kinetic energy and the capability of its body structure and rotors to stretch. On the equatorial orbit the GPV is unloaded into stationary orbit cells located at the same orbital altitude in the plane of the equator. Landing is carried out similarly in the reverse order. The simplest type would be a circular orbital ring in LEO. In addition, he proposed the concept of "supramundane worlds" such as supra-jovian and supra-stellar "planets". These are artificial planets that would be supported by a grid of orbital rings that would be positioned above a planet, supergiant or even a star. The manga Battle Angel Alita prominently features a slightly deteriorated orbital ring. The second iteration of the anime series Tekkaman features a complete ring, though abandoned and in disrepair due to war, and without surface tethers. In the movie Starship Troopers, an orbital ring is shown encircling the Moon. The anime series Kiddy Grade also uses orbital rings as a launch and docking bay for spaceships. These rings are connected to large towers extending from the planets surface. The anime Mobile Suit Gundam 00 also prominently features an orbital ring, which consists primarily of linked solar panels. The ring is connected to earth via three space elevators. This ring effectively provides near unlimited power to earth. Later in the series the ring also shows space stations mounted on its surface. Orbital rings are used extensively in the collaborative fiction worldbuilding website Orion's Arm. Arthur C. Clarke's 3001: The Final Odyssey features an orbital ring held aloft by four enormous inhabitable towers (assumed successors to space elevators) at the Equator. In the close of Arthur C. Clarke's Fountains of Paradise, a reference is made to an orbital ring that is attached in the distant future to the space elevator that is the basis of the novel. In the Warhammer 40,000 universe, Mars has a large orbital ring called the Ring of Steel. It is primarily used as a shipyard for interstellar craft. It is the largest man made structure in the galaxy. In the game Xenoblade Chronicles 2 there is a giant tree that has grown around the base of an Orbital Ring. The third part of Neal Stephenson's book Seveneves has an orbital ring around a moon-less earth. The opening battle of Star Wars: The Clone Wars's Season 6 pilot takes place on some form of ring-shaped orbital space station surrounding the planet of Ringo Vinda. ^ Nikola Tesla, My Inventions, part III: My Later Endeavors (The gigantic machine he is referring to is better known as "air convection" and "weather"). ^ a b Paul Birch, "Orbital Ring Systems and Jacob's Ladders - I", Journal of the British Interplanetary Society, Vol. 35, 1982, pp. 475–497. (see pdf (accessed 6 April 2016). ^ Paul Birch, "Orbital Ring Systems and Jacob's Ladders - II", Journal of the British Interplanetary Society, Vol. 36, 1982, 115. (pdf). ^ Paul Birch, "Orbital Ring Systems and Jacob's Ladders - III", Journal of the British Interplanetary Society, Vol. 36, 1982, 231. (pdf). ^ Техника-молодежи» 1982 № 6, с. 34–36 – "Technical Youth" 1982 – To the space by wheel (in Russian). ^ Anatoly Yunitsky String transport systems: on Earth and in space. Gomel, 1995 (in Russian). ^ A. Meulenberg and P. S. Karthik Balaji, "The LEO Archipelago: A system of earth-rings for communications, mass-transport to space, solar power, and control of global warming", Acta Astronautica 68, 2011, 1931–1946. ^ "Orbital Ring Systems and Jacob's Ladders - I-III". ^ Paul Birch, "Supramundane Planets", Journal of the British interplanetary Society, Vol. 44, 1991, 169. This page was last edited on 22 April 2019, at 08:53 (UTC).